OM/AUM: The three parts of Om (A-U-M) encompass the three states of waking, dreaming, deep sleep, the three levels of gross, subtle, causal, and the three levels of conscious, unconscious, subconscious, as well as the three universal processes of coming, being, and going. Absolute silence beyond the three levels is the silence after AUM. It also refers to Tripura, the one who live in the "three cities" as in Mahamrityunjaya Mantra, as well as the light referred to in Gayatri Mantra. Namah/Namaha: Adoration, homage, respect. Nothing is mine (as an individual person); everything is thine (as the Absolute Reality). The three levels of Om, the three worlds of gross, subtle, and causal, along with the three states of waking, dreaming, and deep sleep states of consciousness, as well as the three levels of conscious, unconscious, and subconscious themselves are "not mine" as the true properties of who I really am. Truly, "nothing is mine." Rather, everything, all of these triads is "thine" or the "other" as the Absolute Reality. Shivaya/Shiva: That Absolute Reality that is the ground out of which the others emerge. It is that "ink," so to speak, that is not separate from the many forms which may appear to manifest or be created from that ink. 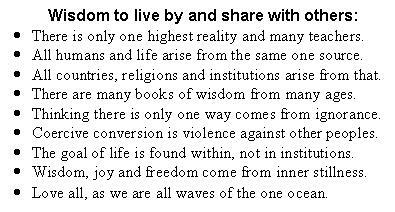 In the Realization of this, one comes to see that he or she is one and the same with the Absolute Reality. The Mahavakyas, the great utterances, are seen to be true. Shiva (the static or ground) and Shakti (the active or creative) are seen to be one and the same. She (Shakti), while one with Shiva is realized in direct experience as the one in the three worlds (Tripura) outlined in Om. The Five Sacred Syllables: The Om Namah Shivaya mantra has five syllables: na-mah-shi-va-ya (sometimes called six syllable mantra by including Om). Thus, Om Namah Shivaya mantra is called five-syllable mantra, or Panchakshara Mantra (panch means five). Among other things, these five represent the five elements of earth, water, fire, air, and space. Thus, the Om Namah Shivaya mantra leads awareness in the reverse order from manifestation back to the source from which manifestation arose.